This has become one of my most favourite cookbooks and has inspired me to buy Ottolenghi's Jerusalem cookbook. The man is an absolute genius. He puts ingredients together that I would not always think of but they always turn out fantastic. None of the recipes are hard to follow or to make either. I just realized that despite doing Notes on several recipes, I haven't done one for the book. I absolutely love this book. It's rare you find a cookbook where every recipe is unusual, different, exciting and above all delicious. I would recommend it to anyone who loves Mediterannean/Middle Eastern flavors. Wow these notes did it for me. This book went STRAIGHT to my wishlist! Superb book, some incredibly tasty recipes most of which are pretty straightforward. From time to time you buy a cookbook and make recipe after recipe from it - this is one of those times. Recommended to friends/family who've all loved it too. Already my very favorite cookbook! Only have had the cookbook 3 days. The most beautiful cookbook I own. Love the food philosophy of Yotam and Sami. Tried my first recipe today - Cauliflower and cumin fritters with lime yoghurt. Served as suggested on pita with hummus and tomato. Absolutely wonderful flavors. Very unique! This was pretty delicious. I skipped the chard, and only used the endive and watercress, along with peaches and hand-cured speck from the farmer's market. There was bitter from the greens, sweetness from the peaches, floral notes from the orange flower water (which I used instead of orange blossom water, but in a smaller amount) and salty punctuations from the speck. This is also a really pretty salad- would be good for entertaining. I turned this into a more substantial salad with the addition of cooked pasta.. Used less orange blossom water, than recipe stated, worked ok for me. We loved the play of salty, sweet and bitter ingredients in this salad. I used nectarines as local peaches weren't quite ready and reduced the orange blossom water to 1 tbsp, substituting orange juice for the balance. The orange water vinaigrette is divine especially with the grilled peaches. Loved the unique combination of flavours. A wonderful salad that I would make again. 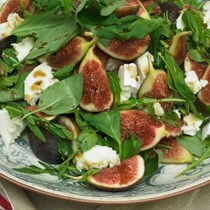 Excellent mix of peppery arugula, sweet figs and honey, and salty cheese. I made this salad as the focal point of a light meal, but it would probably fare better as a substantial side dish, maybe alongside grilled kebabs. The flavor was light and fresh, but I was a little disappointed that the taste of the preserved lemon was fairly muted. The green tahini sauce is excellent, and I can't help but think feta would be a really great addition. Delicious! Added Green beans and rocket for a bit of extra green. Very nice flavor. I did really like tarragon and fennel together. We loved this salad and will definitely be making it again. Great flavours, served on a base of mix leaf, to counter the dominant fennel taste. Think I'll cut back on the sumac a little next time, may have been a bit heavy handed this time. 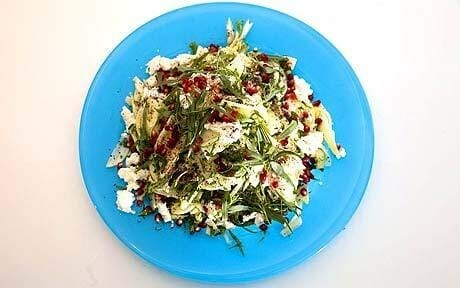 Balance of feta, pomegranate and fennel works really well. Serve with grilled salmon. I was also a little disappointed by this - I love raw fennel salads in general, but I found this one a little lacking, like the other favours couldn't hold their own. It's possibly my fault as the fennel bulbs I had were pretty big. I would definitely be willing to try this again with less fennel (by volume) and more of everything else. Delicious - just as everyone else has already noted. I found it was easy enough to slice the fennel thinly with a chef's knife, no mandoline necessary. As with many salad recipes, I didn't measure the main ingredients (fennel, pomegranate seeds, etc), but just added what looked like the right amount for a good balance of each, and that did the trick. I did not find the tarragon to be dominant, but again, I just added leaves to taste. I'm slightly embarrassed to admit that I have never cooked with sumac before. That will now be rectified as I have a little jar from Penzey’s and I will definitely make this salad again. I followed the recipe to the letter – although pomegranates are out of season I was able to buy one of those packs of the seeds. The balance of the licorice-ish fennel and tarragon, the creamy feta and the tangy pomegranate plus the tartness of the sumac, made for a really interesting mouthful. The only thing I might do differently when I make it again is leave out the tarragon as that flavor was a bit dominant. I'm afraid I was disappointed by this. I had expected the fennel and tarragon to stand out more, and I would have liked a note of richness somewhere. This is such a simple salad but transforms a cucumber into something exotic. I've made it several times and everyone loves it. Love this salad. Young cousins eat it before dinner has hit the table. Big hit. p 20 very simple - if using European cucumber, cut it lengthwise in half and remove seeds - then cut in slices - try Seductions of Rice method of salting cucumbers to remove excess water from cucumber. Have made several times already. The addition of the poppy seeds adds a pleasant crunch. New go-to cucumber salald the whole family loves. This was pretty good, but as with many cucumber salads I found the ratio of dressing to cucumber was a bit off. The flavours were nice and it the poppy seeds were a nice touch. Good enough but not blown away. 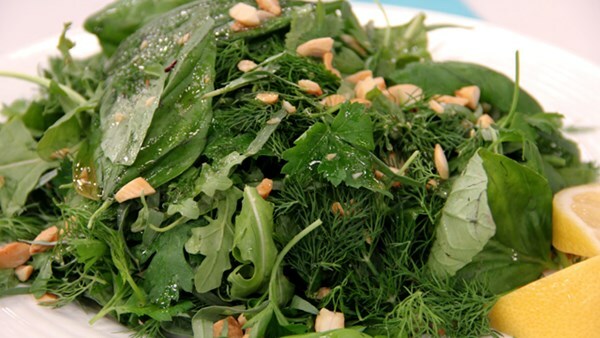 This salad is very crunchy and tastes really fresh. I used medium cucumbers and didn't scoop out the flesh but would try it that way next time. I enjoyed this salad. I cut down considerably on the amount of oil used to suit a friend's dietary requirements and I don't think the salad suffered for it. Agree with wester that this is a refreshing, fragrant salad. I love being able to pick all of the herbs from my garden! Great taste and texture contrast with the almonds too. Will be making this again. I liked the taste of this; the butter is a nice touch, and it is refreshing and fragrant. I did think the tarragon was a bit overpowering (I will use only half the amount next time) and I am not sure picking the leaves was worth it (I will just cut them up next time). Delicious even without the tahini sauce (I forgot to make it). It's too hot to turn the oven on, so I sauteed the eggplant on the stove top, then covered and let cook until the cubes were creamy. I don't like cilantro, so I put in extra oregano and it was great. Wow! This will definitely make an appearance again soon with all the eggplant I have growing in the garden. The roasting of the eggplant brings a little smokey flavor, the herbs and lemon in the marinade bring a fresh punch, then it's all topped off with a tahini creaminess. I had a couple small white eggplant, which brought a little lighter presentation to the dish than is in the color picture. This was good but not spectacular. I thought this was so delicious I couldn't stop myself sneaking pieces every time I passed the dish as it was marinading. I made the tahini sauce and although it was good I think I preferred it without the sauce. There seemed to be a lot more herbs in the photo in the book than I had but I thought it was great as it was. Half the recipe was left over (cannot get my kids to eat eggplant) so I'll see if it's even better tomorrow. This was good either with or without the tahini sauce. It was much lighter without the sauce but the tahini added richness. Well worth making, a good summer dish. I find that baby spinach works better than rocket. I've had my eye on this recipe for a couple of weeks....just waiting until I had the right mix of vegetables and a little bit of time. Do not be put off by the early warning in the instructions which indicates that there is a fair amount of prep time for the individual vegetables. I didn't find that to be the case compared to anything else that I might make, especially for a complex salad. It's definitely worth the time. I did make some substitutions to the recipe to fit what I had on hand and collected: locally-produced goat cheese instead of the manouri and the addition of oven-roasted edamame instead of the second courgettes (zucchini). I also did the charring on the grill instead of a griddle pan. This was an immediate hit and it's gorgeous and inviting. The basil dressing is nice with the garlic and I used my good olive oil for this one. I agree that the prep for this salad doesn’t need a ‘warning’! It was delicious. I made it for Christmas Day and it was fantastic. I used haloumi instead of Manouri and it was absolutely fine. We loved this! I served it hot as a side dish though, alongside pork satay & rice. I couldn't find hazelnut oil so I used avocado oil with a little sesame oil mixed in. It's turning out to be the year of the green bean with loads coming from the garden so this was a perfect choice for a hot summer day. I really liked the combination of flavors with the orange zest and the hazelnuts mingling with each other. I was short a few snow peas so I added a couple handfuls of shelled edamame. Next time, I will mix up the oils, chives, and the garlic a bit ahead of time so that those flavors come together a bit more, especially the garlic. This has become a go-to salad in this house. I have served it as part of Thanksgiving, as a side for large BBQ dinners, and just because I see some lovely haricot verts. The nut oil is important, but we no longer add the chopped nuts since there are often "textural" eaters who don't like that crunch. As with many recipes from Ottolenghi, we reduce the amount of oil/dressing to an amount that pleases us. Very delicious side dish (I served it with roast pork belly and roast potatoes). Since it is served at room temperature everything can be prepped in advance then just mixed together before serving. My son who doesn't like many vegetables loved this so it will now be on rotation. This was a delicious combination, and easy to make. I wasn't quite sure what to do with the rest of the orange after zesting it, but it did seem like the recipe could use the juice as well, so I put that in. 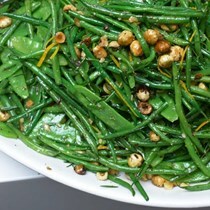 Here's the recipe online: http://www.womanandhome.com/recipes/532750/french-beans-and-mangetout-with-hazelnuts-and-orange I find the recipe as is is too much oil so I cut down the amount and add the juice of the Orange for acidity. Use really good and fresh olive oil! Wonderful combination of flavours and textures. I omitted the olive oil as the nut oil was sufficient. This is pretty tame by Ottolenghi standards (no really "out there" ingredients) but once again the balance of flavours is spot on. I agree that the seasoning at the end is important, especially if you've cooked your greens in unsalted water, and I'd recommend Maldon or another sea salt in large flakes for a slight crunch. I think I'd increase the quantity of hazelnuts next time - maybe up to 100g - and possibly use just half a clove of garlic. I wasn't wowed by this salad, its nice but not great. Maybe the nut oil isnt optional? I think the dressing on this salad doesn't do justice to the ingredients. Forget the olive oil, the nut oil is enough and with a touch of acid, I used verjuice, it was so much better second time around. Needs generous seasoning too! I was impressed with this salad. I only had olive oil at hand and cut back on the total amount of oil suggested. Make this one again (with nut oil). I thought this was a big improvement on steamed broccoli. Make sure you completely drain the broccoli before it hits the griddle pan. Recipe suggests serving with toasted flaked almonds or lemon on top - I went with lemon although either would have been delicious. I grilled this over a charcoal grill instead of a grill pan. In the future, I'd blanch the broccoli longer as it never fully tenderized on the grill. Not a huge fan of broccoli but this adds a whole new dimension. I used the sliced lemon instead of almonds in mine. I followed the cooking method found here for the broccoli, but left out the almonds and chile, seasoning it just with the garlic and lemon. I also included the stems, sliced vertically. While there's really no reason not to include them, next time I will peel them as the skin was a little tough. My broccoli could have also used another minute or two in the boiling water, just to ensure it was tender. 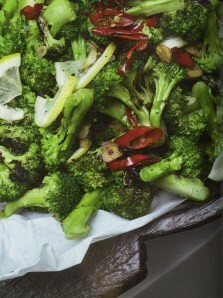 This is a good method for broccoli, similar to roasting it. Great make ahead as it doesn't have to be hot, hot. I heated the oil, pepper and garlic just before serving and poured it over after heating the broccoli pan for a minute or two in the hot oven. Used the peeled stems too. Easier than trying to watch and roast the broccoli when the guests are all here. I didn't measure the oil for this, just eyeballed what looked like enough. I used a red jalapeno for the chile. My broccoli did not really char much on the hot grill pan, but I didn't want to overcook it, so I just took it off. But still delicious! Very easy, and compatible with many main courses. I used it to accompany the Spanish shrimp in olive oil from the December COTM, and it was a lovely pairing. I loved this! I used the stems, too, after peeling them and cutting them into thick matchsticks. 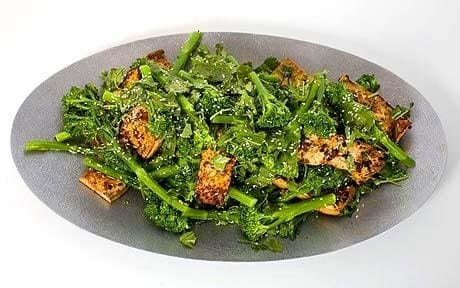 Just delicious if you get the broccoli good and blackened. For the vegetables, I just used broccolini and sugar snap peas. The caper butter was very tasty, although I might reduce the amount of capers next time (if not adding salsify or other root vegetable). I didn't have chives, just dill, parsley, and tarragon - very flavorful and easy. Fresh tasting vegetarian dish. Okra was minimally slimey. Love the sweetness of tomato with the heat from ginger. It was a revelation to me that I didn't have to peel the butternut squash, all the time I've wasted in the past! The skin is pretty edible after roasting. I was a little too conservative with the olive oil, you can see that my slices look a little dry. But we thought this was very tasty. I like the nuts, seeds, and basil scattered over the top. I can't really say that I could taste the nigella in such a small amount, I might up the volume a little next time. It is basically a very easy dish. Burning the eggplant takes a little time, but I did mine under the broiler so I didn't have to tend it constantly. You need a sauce if you want the nuts and seeds to cling to a bite of squash. I might try a variation by just tossing the squash first in olive oil, and then in the same toasted nuts and seeds but coarsely ground. Loved the burnt egglant! Not so time consuming when you stash burnt eggplant flesh in the freezer; the most difficult thing was picking out the bits of charred skin before seasoning. The flavor profile is totally different than baba ghanoush and maybe even better. The two components are good but I don't really feel like they fit together. Did not have fresh basil to garnish the squash. This was lovely! I did cut a few corners, though, to save on energy - the seeds went in with the butternut about 10min before the end of roasting time, and the aubergine got cut up and roasted in the same oven as the butternut. It might not have had a smoky flavour to it, but it was great nonetheless. Served in a pita with hummus and tomato. So very good!! Outstanding! Pg. 50 As he says, these were very reminiscent of pakoras, just a bit doughier On the whole I liked them, but I would prefer them to be slightly crisper. Perhaps a bit less egg and slightly hotter oil, with closer to two TB of batter per fritter. Sauce wise I liked them lightly dabbed with the yogurt dressing as too much was overpowering of the light but lovely cauliflower taste. Delicious. I made mine with some finely chopped chilli for a bit of heat and kept them on the small side to allow them to cook through quickly. Served with salad and some left-over salsa as well as the yoghurt dressing. This is a simple recipe for Otolenghi/Tamimi but it still took @ 90 minutes with all the chopping and frying. I found the cumin to be overpowering, and normally I love it. I reduced the egg per Delys77's suggestion but still found them very moist inside even after 30 minutes in a 325 degree oven post frying. Not sure I will make these again. This makes for a fun, tasty vegetarian entree. My husband remarked that they reminded him of fish and chips, and I realized that the combination of fritters and lime yogurt sauce did indeed bring fish and chips to mind! The fritters were very light and tender in texture, with a faintly crisp exterior and a subtle warmth from the cumin, cinnamon, and turmeric. This is a great spice combination - the cumin and cinnamon really balance each other out, and the turmeric provides an underlying sweet earthiness. I chopped the cauliflower very finely, and it was thoroughly cooked in 10 minutes, then just melted into the batter. The lime yogurt provided a good tart accompaniment, and was by far my three-year-old's favorite part of the dish. These were excellent. I must confess - I did make some significant changes though. The yoghurt sauce was very nice. I used lemon as I had no lime -so good that I made another batch to use as a dip for chips. For the fritters I made the following changes: two eggs in place of four, supplementing liquid by adding about one quarter cup of water, added one half teaspoon of baking powder, one additional chopped shallot and one half hot red pepper minced. I pulsed the cauliflower after roasting in the oven for about fifteen minutes at 400 degrees Fahrenheit. Oil was very hot when I fried the fritters. 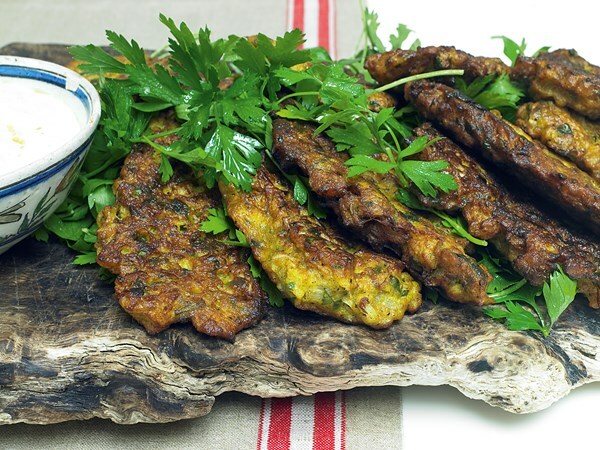 My family really enjoyed these -resulted in crispy fritters with a more intense cauliflower flavour. I thought the spices were perfectly balanced and the tastes were complemented by the lemony yogurt. We love this too. I don't chargrill the cauliflower but mix with olive oil & cook in the oven at 220deg (fan) for 15 minutes. This chars it very nicely & it's a lot less work! After reading my own note about the cauliflower fritters on the facing page and how time consuming I found them, I decided to make this. Had to improvise as there was no fresh dill at the store- I used a mix of mint, cilantro and watercress. The mint predominated but I think the herbs were a success. I do want to make it again as written. I could make the vinaigrette over and over- yum. A favourite in our household. I served it at room temperature and it was still very nice the next day. I have made it on 3 occasions and loved by all. Loved this and it was just as good cold the next day as a salad. I ran out of time so didn't dry the cooked cauliflower florets and char-grill them in a griddle pan. I will try to do that next time but even without that step I thought this was a fantastic vegetable dish. The dressing of capers, wholegrain mustard, garlic and cider vinegar plus the dill made for a really flavorful dish. 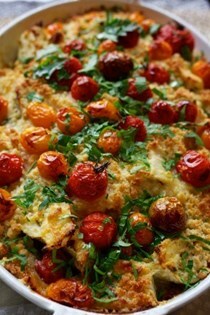 And the red, white and green of cherry tomatoes, cauliflower and spinach was so pretty. I will definitely be making this again. This time I served it with the Marinated turkey breast with cumin, coriander and white wine on p.126. I finally got around to making this dish after years of lusting after it. Thankfully it did not disappoint. It was a bit time consuming to grill the cauliflower after par-boiling it. I like Poppyseedbagel’s idea of oven roasting the cauliflower and will definitely do that next time. It is such a beautiful dish to look at and to eat. Only change I made was to cut the olive oil in the dressing back to 2 tablespoons and omitted the other 1/4 cup for coating the cauliflower. Really tasty, a good accompaniment to the marinated rack of lamb on p. 104. Needs plenty of salt and the crumble recipe should have the sugar reduced when used with something savoury like this. Yesterday I started the peppers marinating, then this evening I added the buffalo mozzarella. Unfortunately, I did not check back with the recipe and completely forgot they were to be served atop arugula. Still, the marinade was good, and I plan to make an arugula salad with the leftovers tomorrow. This is a very good choice for a salad that can be mostly made in advance. 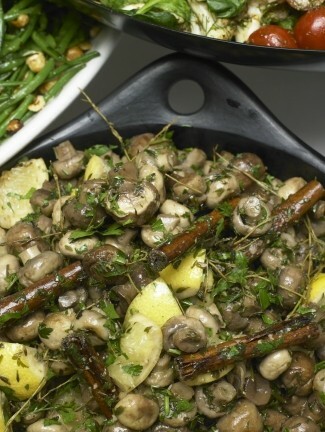 Really good recipe for long stemmed mushrooms like beech and enoki. They lemon juice and olive oil make the stems silky and delicious. Meh-shrooms. Edible, and the barley/mushroom combo is a classic. The extra work required to put the combo in this format wasn't really worth the trouble, imo. In particular, the preserved lemon did not add the zing I was hoping for. Drizzled the leftovers with a little of the preserved lemon liquid which helped a bit. This was delicious- a great lunch. I followed the Serious Eats proportions of stock- and since I was using instant barley the cooking time was only about 20 minutes to absorb the stock. I had huge portobellos, and needed to cook them 20 minutes at a higher temperature (385) to get them to cook sufficiently. Delish! Also easy enough that I could give the recipe to my husband and say: Do this. I had him make two changes: Nuke the potatoes instead of boiling them (easier, fewer dishes, and I think tastier). Use sage as the finishing herb instead of parsley; doubling up on the sage is good. The layers of flavors are fantastic.....a new family favorite. An excellent main dish for vegan guests. I made this without the Jerusalem artichokes, but will certainly want to try it again once I have some on hand. The lemon, olive garlic, and tomatoes are fantastic with the potatoes (I used German butterballs). The only problem was some of the lemon slices started to burn. It's probably best to make sure they are layered on top of the potatoes to prevent this, not sitting on their own on the pan. And, while this is not a difficult dish to make, it requires a lot of cooking/baking time, so is not the easiest side dish for a weekday. I made this again with the Jerusalem artichokes - delicious! This was great, albeit without olives, which I'm sure would have lifted this to amazing (adverse husband!). Can break it up to cook spuds in advance, making this an easy midweek side. Definitely to be repeated! Loved this dish (despite not including the jerusalem artichokes). I made this one with potatoes only and loved that they became soaked through. Good mix of sweet, savoury and sourness in this dish. This has become a family favorite. Streamlined the recipe to baking the potatoes longer instead of parboiling. Often sprinkle with feta for a complete meal. In a pinch we substituted oil marinated artichoke hearts for the Jerusalem artichokes and the earthiness made for a good substitute. Tasty. Made a few changes (skipped the raw garlic and chervil, using parsley instead), and used baby spinach and rocket instead of the chard. This was a really good winter salad. May skip the sunflower seeds next time. Seemed like too many sunflower seeds, but otherwise yummy. Would definitely suggest using chervil - don't know if it would have the same impact without it. I made the dish with only red beets, used parsley instead of chervil, champagne vinegar instead of sherry vinegar, pepitas instead of sunflower seeds, and tossed in arugula for the greens. The flavor of the dressing is a really nice match for the beets, but I found that a lot of it puddled up into the bottom of the bowl and didn't soak into the beets as well as I had hoped. I would like to try it again with the sunflower seeds and chervil; pepitas and parsley were still good, but I would either mince the parsley or leave it out next time. Beautiful salad with a good mix of flavours. Made with only red beets. Beautiful side dish, to look at and to eat. Since it was just 2 of us, I cut the recipe in half. Used golden beets, arugula, and parsley (instead of chervil). Recipe makes too much dressing, but that's ok. I saved the remainder and I think it will be lovely on a simple cucumber salad or green salad. The only issue was too many sunflower seeds, but that is easy to adjust next time. Will definitely make this again. There was something magical about the combination of sherry vinegar, maple syrup, beets, and arugula. We were very happy with this dish. I saw it as more of a warm potato salad. I used baby red potatoes, fresh sorrel, jarred horseradish (no fresh to be found), and fage yogurt. And of course, garlic, olive oil, salt and pepper. I just smashed the potatoes a bit, there was still plenty of particulate matter. I plated it with upland cress and sliced scallions. The sorrel added a nice flavor, next time I might even add a bit more than the recipe states. The funny thing about this dish is that I kept wanting to taste more salt, even though I had actually added enough. I realized that I was looking at the red potato skins and expecting to taste prosciutto! Maybe I'll try it that way next time. Out of 4 people, 2 the one wiith a sweet tooth, liked it a lot, me and my husband find it way too sweet, need to cut the sugar and top with acidity. This tastes very good but very rich. I have a feeling that I didn't use fresh sage when I made this (a while ago) which was a shame - would use if making this again as I think it would help complete the dish. I have made this twice. It is a superb recipe to make ahead of time. It looks stunning brought to the table. Cooked this as a vegetarian meal, so just rocket salad to go with it. Very very good! Leaving the skins on is a great idea and helps the texture. Standing potatoes on edge and arranging in a circle looks beautiful and gives each piece a crusty top. Did the same arrangement with normal potatoes-shallots-thyme-pepper combo and it was superb. Much nicer way to do gratin than traditional layers. Very decadent. I agree with smtucker - don't bother mixing the spuds with the herbs, just whack them in once you've stacked the sweet potato slices in your gratin dish. Might need something on the side with a sharp/bitter edge to offset the richness of this dish. Throwing the potatoes and herbage into a bowl is a total waste of time. Almost none clung to the potatoes and I ended up tucking all the garlic and fresh sage into the gratin pan. Plus, then your slices are all mixed together and you have to restack them to make it pretty in the gratin pan. Cooked this time at 325º (not 400º) and much preferred the texture of the potatoes. NYEve 2013. A crowd pleaser and summer favorite. Fantastic. Made with wild rice instead of camargue red. Fabulous. Good Potluck dish. Interesting flavors. Yumm! I found this recipe on a blog and have been making it for a couple of years now. One of my all-time favorites. The dish that got me to buy the cookbook. So glad all the preceding notes convinced me to try this out. Substantial salad that went well with pan fried brill for lunch. Mark, Jules and Rick loved it. Excellent, and just a bit more lemon juice was perfect (more like a whole lemon instead of 2 tsp). I love this dish. It is a great dish to make in advance to bring to a picnic or pot luck. One tip ... if you are making it in advance, don't add the arugula until shortly before serving. I found this time consuming to make, but entirely worth it (like most of the Ottolenghi recipes I've tried, actually!). It's something that doesn't blow you away with the first bite, but then you find yourself coming back for just a bit more...and another bit more... Even having said that, as a side dish I think this would easily stretch to feed 6, maybe even 8 people, rather than 4 as the recipe says. I used jarred oven roasted tomatoes since I already had some on hand, and because it meant I could put the dish together quickly. I did add balsamic vinegar and a little sugar to the dish to keep these flavors in the mix, but I didn't have tarragon or labne. Next time, I hope to include both, especially since I found I can buy ball-shaped labne at my local Mediterranean grocer, just like what Ottolenghi used in the picture accompanying this recipe. Making this a second time, I added semi-dried Pomodoraccio tomato halves, which were far superior to the thinly sliced ones I've gotten at Costco (good thing, considering they're also far more expensive). These, along with local fresh made lebneh, really brought the dish to another level, although I still didn't have nigella seeds or tarragon. This is another delicious combination from Ottolenghi- with the sweet caramelized onions, the acid tomato, and the anise flavor of the tarragon. I loved the combination of the textures between the mograbiah and the couscous. I loved this and didn't have nigella seeds or tarragon - used feta as couldn't get labneh - delicious. I roasted the tomatoes a couple of days before and kept in the fridge. I found this to be a flavorful and easy winter meal. I had garden tomatos roasted last September, and waiting for just this moment. I lucked into a bag of Mograbiah, but couldn't find normal cracked couscous, so used Israeli couscous as my second. The tarragon added a very nice flavor. I couldn't find Nigella seeds, and substituted a mix of sesame and cumin seeds. I cut back on the olive oil significantly. Really good side dish. Quite sweet with caramelized onions, roasted butternut squash and cinnamon but very tasty. I didn't have all the fresh herbs the recipe called for but it worked just fine with mint and chives. Love this salad, but the amount of couscous needs to be reduced by half to keep it in balance with the rest of the ingredients (esp the butternut). I often substitute quinoa for couscous, and dried figs are a great alternative to the apricots. Would recommend adding the cinnamon carefully so as not to overpower the dish. I used canned sour cherries instead of dried (guessing that around 150g would be about right). This was quite different from anything I've done with lentils before, but I greatly enjoyed it. Out of character for me, but I made the recipe exactly as written! This was great! Salty, umami bacon, creamy gorgonzola, tart-sweet cherries, a dash of vinegar, it all worked together beautifully. A main course for us, it would also be a fine first course in smaller portions. Speaking of portions, this made a huge amount; we’ve got tons of leftovers. I served this with a garbanzo flour waffle, which went along quite well. Mr. Nightshade has requested this entire meal gets done again sometime in the future, pretty unusual request from him for a lentil dish. Really interesting flavours which work well together. It's probably best as a starter sized portion as the novelty does *slightly* wear off with larger quantities. A very good recipe, we used canned chickpeas instead of dried. The taste of the sweet potatoes with honey contrasts well with the lemon and yoghurt dressing. This will be going on a list of favourites. This reminds me of khow suey. Really delicious. Used canned or precooked beans to speed up the process. Pg. 82 Overall a very tasty dish. I agree with the other comments that the honeyed sweet potato contrasts very well with the tangy yogurt and savoury tomato sauce. I also used canned chickpeas, and added a bit of chicken stock as my canned tomatoes didn't make for enough liquid in the pan. I also tossed the cilantro in to the pan at the end of cooking, and went with about 150 grams of spinach. I did worry the already sweet potato would be far too sweet with the honey, but the result was smooth, sweet, and smoky, just right really. The sweet potatoes were the best part of this. The chickpea mixture was okay but it was a bit bland and didn't pick up much flavor from the spinach or tomatoes. The yogurt sauce complemented everything well. Delicious, made garbanzo’s in my new instant pot and needed a quick dinner. Miracles happened as I had all the ingredients. Great leftover too. Deceptively time consuming, but worth the effort. I also cooked this with the chicken, sumac and za'atar recipe in the same book and they went well together, but this dish would stand on it's own as an entree. Three small tweaks I plan to make the next time I make this: 1. Halve the oil which is used in the tomato sauce which accompanies the dish. 2. Use a little less cinnamon, especially if you are grinding your own or have relatively fresh cinnamon in your cupboard. 3. Use red onions, and double the amount the recipe calls for. The onions are delicious and as some are held back to top the finished dish, just hold back the extras and people can decide if they'd like to add more. An amazing rice dish - even my rice-phobic other half likes it! Goes really well with the beef and lamb meatballs in this book. This was great! Took forever, but most of that time didn't require close attention (letting stuff simmer and stirring occasionally). I agree with previous reviewers that it needs more onions. I probably wouldn't make this on a weekday ever again because of how long it took, but it would be a great weekend lunch. It also made a ton of leftovers, which was a nice bonus. As mgwalter states this dish is quite a labour of love. I had time to make the spicy tomato sauce the day before and I'm glad I did. I also followed their recommendation to half the oil and cinnamon and was very happy with the result. I served it with the lamb & barberry meatballs from Jerusalem also by Ottolenghi. Great dish, even though I overcooked the rice a bit. Doubled the onions and it worked out well, would double the tomato sauce next time to cover up my bad rice cookery. With chopping, took 1.5 hours for me to make. It's not an easy weeknight dish, but it's not as time consuming as other people made it seem to me. Careful when adding the rest of the filling ingredient to the rice, it burns easily. It tasted good especially the day after but in this recipe I found Ottolenghi was not as bold as usual. I definitely like more herbs in my stuffed vine leaves. This was nice enough but we weren't wild about it. Definitely needs the lemon! I ended up blitzing the soup at the end because - as Rutabaga noted - roughly chopping the chard as per the recipe just isn't enough! We liked the flavors in this soup, but my husband was not a fan of the chard. This was largely, I think, due to the fact that while I thought I had successfully chopped the chard into fairly small pieces, we still ended up with some long ribbons of it in the soup, which he found unappealing. I would make it again, but be sure to finely chop the chard. And because the crunch of the coriander seeds was something neither my husband nor son enjoyed, I would substitute a pinch of ground coriander. Adding some chopped preserved lemons could also be great here. The lemon does make the difference. Be sure have it on hand. I loved all of the lemony components of this dish- the chard, coriander and of course the lemon (juice and rind) itself. Those elements, plus the cinnamon, really make this dish for me. This was quite tasty--Indian-inspired. A bit fiddly (as most of the recipes seem to be) but not too bad. I like the tarka-ish idea of the coriander and garlic sauteed separately and put in at end. I put it quite a bit more chard than suggested--didn't do wonders for the texture which was a bit thick, but I appreciated the extra veg. Great with a dollop of greek yogurt on top. I liked so much more Nigel's Slater Lentils and chard soup with mint.I don't enjoy much the red lentils unless mixed with other lentils for an interesting texture. Needed help: double coriander seed and cumin. Zested lemon rind and 1/2 lemon juice. (I know it says to add the lemon at the table but with the early addition the soup tastes bright and yummy to begin with.) Also added more liquid (4 cups, some of it chicken broth) and 2 packages of cooked sausages to make it a complete meal (DH likes his animal protein). This was a delicious, full-flavoured soup. Since I was serving it in shot glasses, I skipped the chopped garnish but cooked those ingredients (celery etc) with the peppers and garnished with thinned yogurt instead. I really liked this recipe. Only used a little saffron, but you could still taste it distinctly. I added about half a cup of red lentils in addition to the chickpeas which helped to thicken the soup. Really disappointing, I used too much saffron which didn't help but the dish is quite boring - unusual for this book. This was sooo good. I didn’t have saffron left and it was fine without. I used lamb shoulder. Used 3 cans of chopped tomatoes. And a mix of broth and water. Really nice, goes very well with the Fennel Gratin on page 52. Absolutely delicious and, for an Ottolenghi recipe, very simple. Will definitely make again. No sides are mentioned but think most people would want a carb - couscous would work well. Otherwise, easy to follow recipe with tasty results. None of the ingredients are too tricky to source, most are store cupboard staples. The soft figs, creamy goat's cheese, crunchy walnuts alongside the garlicky lamb and herby salad with the sweet, sticky sauce works well - the perfect bite when you get a little of each. Dry bread instead of cous-cous works better. Need plenty of seasoning and to be browned REALLY well. A bit more courgette is a good thing too. I wasn't wild about these. I thought the vinegar in the sauce was a bit overpowering. Great make ahead dish. I flash freeze the meatballs and finish them in the oven with the tahini sauce just before serving. Quick and easy, so it's perfect for a weeknight dinner, but plenty of flavour and good enough for company. Served with roasted asparagus. The extra sauce worked very well with the asparagus. This was very disappointing - too sweet and nauseating. The tahini sauce was not great - too much vinegar. Maybe it was the quality of my tahini. All the other Ottolenghi recipies I've tried have been fantastic, but this was actually inedible according to my palate. Sorry. Even my husband couldn't finish it. As suggested by the title, the recipe does include beef mince too! However, no harm done making them 100% lamb, I found it an easy method for creating good meatballs. I made two of the three sauces to accompany grilled beef filet. The sauce with watercress and mustard seemed a bit too similar to the sauce with rocket and horseradish, so I made only the latter. The green sauce is a simple puree of rocket, horseradish (I used jarred, still can't find fresh), garlic, olive oil, milk, salt, and pepper. Once pureed, greek yogurt is added and stirred in. What could be easier? Choka, the red sauce is made from cooked tomatoes (burnt in the skillet per directions, I charred in the oven instead), sauteed onion, mild red chile (I also roasted the chile), garlic, cilantro, paprika, oil, chile flakes, salt and pepper. We liked both of these sauces quite a bit. The choka does have a smoky taste which is perfect for grilled beef. The green sauce is a refreshing contrast. Together, they make a colorful plate. We adults enjoyed it a lot, the kids not so much. I found it quite simple and not very involved for an original Ottolenghi recipe. I streamlined it by also using only one Dutch oven throughout the whole recipe to avoid dirtying multiple pots as per the suggestion of another reviewer. A very good spicy stew recipe. Ox cheeks work well to and are easier to eat than oxtail - might even be worth using the cheeks as a main meat but sticking some of the thin oxtail pieces you get in to give some bone flavour/gelatin. Probably needs some water/stock adding before going in the oven. Be careful with the orange zest, doesn't need much. Serve with just some garlic bread, it's substantial enough to not need much else. Made with regular beef stew meat instead of oxtail. Used butternut squash instead of pumpkin and canned whole tomatoes instead of chopped. Did need more liquid during the oven cooking time. Very good even without the oxtail and the meat came out very tender. Didn't get quite as much flavour from the spices and herbs as I expected. Used a Dutch oven throughout the recipe to avoid dirtying multiple dishes. This was simply okay. Despite using oxtail, there wasn't much beefy flavor and none of the flavor of the spices came through. The texture of the pumpkin was a bit stringy. Finally, there was a bit of a bitter flavor throughout the stew. Very good, per my husband. I was going to use tangerine and lime for the grapefruit substitute because I cannot eat grapefruit. As it turned out, I got a stomach virus, after marinating the chicken, so it stayed in the marinade for close to 48 hours. And since my stomach was still recovering, I just used grapefruit and made it for my husband. I had a little bite of chicken without the sauce, it was quite good, I used a store brought jarred harissa. The sauce smelled wonderful. Fantastic flavor on the chicken once it was done marinating. Great recipe, and couldnt be simpler if you buy a good quality harissa instead of making from scratch. Just made this last night using a friend's homemade Harissa. I used skinless boned chicken thighs. As TrishaCP described. I made half the sauce and had plenty. Another delicious one from Ottolenghi. This dish is really all about the interplay between spicy, sweet, bitter, and tart flavors and gauging the correct balance between them. I screwed up the harissa (overestimated the spice from my chiles), but was able to recover the balance with some hot sauce. I prepared this with store-bought harissa (my bad, but I had the jar in the fridge), and greek yogurt. So easy to get the chicken marinating and then cooking. The sauce took a bit longer. I suggest you get the sauce reducing before putting the chicken into the oven. In typical Ottolenghi style, this recipe will produce a flavor explosion in your mouth. Note that one could probably get by with 1/2 the sauce, or even less maybe. I don't like using so much maple syrup! The only real complaint from my family was that this chicken "too flavorful" - voiced by my 15 yr old daughter. I allowed the chicken to marinate for 24h, and for me, this allowed the chicken to really pick up the flavors. Next time I would use less red onion -- I used only one, but it was huge, and for just a single scrawny chicken. There was so much onion that I think it inhibited the chicken from getting really crisp. I might also use slightly less lemon - maybe only 1/2 sliced. The kids found the flavor a bit too sour, but adults just loved it. Sorry to report that this dish didn't hit home with us. I was pretty excited about it, and I very much liked the aroma while cooking. I also liked the idea of roasting the chicken on a tray together with the onions, etc. I did marinate the chicken for over eight hours, but didn't feel that the tastes really merged, or that the chicken picked up a lot of flavor. And as much as I like pine nuts, I felt they were just sitting on top of the chicken without a lot of purpose. I had fresh, fragrant za'atar, so I don't think that is the issue either. Don't get me wrong, we didn't hate it, it was decent, just not great. Could try it again and brine the chicken first, but I don't think I give it a second go. The chicken was perfectly cooked at 40 minutes. It was really moist. The flavors were more subtle than I expected. I didn't include the bread. I really enjoyed it, while husband thought it was a bit boring. There's a lot of prep involved to prepare the marinade, but once that's done, the rest is a breeze. I marinated it for about 9 hours. I'd make this again, but since husband wasn't crazy about it, I probably won't. I agree with the four star rating. I marinated the chicken for about 4 hours. I thought it was very good but not extraordinary. The pine nuts were a good addition for a nice crunch but I think I could have used them more sparingly and had the same effect. I served this over couscous and the chicken really flavored the couscous as I served it on top with some pan juices. The foil on the baking sheet for easy cleanup is a must. I have to add that I love dishes that I can marinate the night before and then just cook when I get home from work. This is one of those so I think my family will have it again! Quite good! Line pan with foil. I actually was disappointed with this dish, the first time that has happened with an Ottolenghi recipe. It's probably my own fault as I didn't marinate the chicken for long enough - just 1.5 hours rather than his recommendation of a few hours to overnight. Also I think my za'atar was rather stale. And I hadn't noticed cjb's recommendation to line the pan with foil, which would have been a good idea as the pan was a complete mess. But even with all those shortcomings from my side I don't feel interested enough in this to make it again. This came out great, except with soggy chicken skin. The sauce which was in the roasting pan was heavenly, so we peeled off the skin and ladeled on the sauce. Was only able to marinade the chicken for about an hour, but it was incredibly flavorful thanks to the sauce the and heavy hand of spices and herbs this dish calls for. Will most definitely make this again. Surprised to see most people weren't too impressed with this recipe as I thought it was delicious. My husband said the breast was a bit bland but my leg was yummy so next time I might just buy chicken legs instead of quartering the chicken myself. I let it marinate for about six hours. Agreed that lining the pan with foil is a good idea. I made this the night before as a one pot meal. It's really important to season well with salt and sumac. It's also important to season the onions well. I did not let it marinate more than half hour due to time. I followed everything to the tea, but assembly was in a pot with addition of baby potatoes. The added line nuts with the pottery parsley were a great addition. Cooking it in a one pot, the juices of the chicken remained and gave an additional depth of flavor. It tasted perfect the next day and the family loved it. Overall this was pretty good, but much like some of the others I found that the results weren't necessarily worth repeating. The caramelized onions with the touch of lemon and spices were very nice with the chicken, but I definitely agree that the pine nuts didn't do much for the dish. A little disappointed by this one - the flavour was OK but I won't be rushing to make it again! Fantastic tasting chicken dish. I loved the mix of textures in this one. I followed the recipe exactly, except for cutting the chicken into six pieces as we found the four-piece cut in the other chicken recipe a bit unwieldy. We loved everything about this dish, the smells while cooking, the textural contrasts, the beguiling flavors. I would warn against this dish for people who don't like floral, perfume-like essences in their foods. The rose water is very prevalent in both smell and taste. I loved it. The taste and heady aroma just transported me to an exotic locale. This was an amazing dish- the fragrances of the rosewater and cinnamon together, with the roasting smells of the hazelnuts and honey, elevated this beyond any other chicken dish I've ever had. I was motivated to do this dish because I had a big harvest of Shiso leaves in the garden. I has been a great hit and one I do many times for dinner parties. Really delicious. This is a very nice salad, although I felt it could use a little more dressing. I would increase the dressing amount by about half next time. I simplified by using a store-bought rotisserie chicken, so I didn't have much in the way of pan juices to add, which probably affected the flavor. But I cooked the basmati rice in homemade chicken stock, which helped capture some of that flavor. I also used red bell pepper instead of chiles to keep the flavor mild enough for the kids. It's a versatile salad I can see using for many occasions, and can be made in advance, although it would be best to add the herbs just before serving. Loved the sauce, meatballs not so much. Loved this recipe! Not as labor-intensive as some of his others. I baked the meatballs like some of the other comments suggested (for about 20-25 minutes) and they turned out great. I didn't peel the pepper skins off of the peppers, and the sauce wasn't as smooth as it could be but I wasn't bothered by it. Amazing. I agree with others that the roasted pepper sauce is outstanding. Wouldn't change anything in this recipe. Like TrishaCP I pan-fried on a non-stick skillet and was able to reduce the oil needed. Will be making these again. The roasted red pepper sauce is a must with these delicious meatballs. Next time I might have to make extra, all devoured very quickly. Superb pepper sauce. Meatballs tasted great and were a success with kids as well. Pg. 125 These were very good. Double the recipe for 4 but keep the sauce the same. Baked for 17 at 400 and then 17 at 375 on convection. Easy weeknight meal. I thought the meatballs were fine (I "panfried" in a non-stick skillet and didn't need oil). The sauce however, is unbelievably amazing- it paired really well with the corn and cumin in the meatballs. Vegetarians should consider just making the roasted red pepper sauce (spicy and sweet from chiles and sweet chile sauce)-it will go well with corn, potatoes, green beans, eggs, etc. I followed both recipes pretty closely, except that I tend to round up slightly with spices, and I used a smaller amount of oil in a non-stick pan. Also, my red peppers were a little more bitter than usual, so after tasting the finished sauce, I added a touch more sweet chili sauce and that seemed to brighten it right up. Although I was a little doubtful about browning the turkey balls in the pan and cooking in the oven for only five minutes, they were perfectly done. We liked this dish quite a lot. I especially liked the turkey-corn-cumin flavor combination. The red pepper sauce adds a nice contrast, in both taste and appearance. I loved this - the combination of the strong, spicy roasted pepper sauce with the mild meatballs was lovely. Next time I think I'll just go the oven route as I found the meatballs rather soft and they also stuck quite a bit in the pan while I was browning them. The meatballs in the photo in the book look so evenly browned - I can never get my meatballs that even. Definitely a keeper. These were excellent. I modified a bit. Added a bit of Parmesan and a little mayo to bind meatballs. Baked at 375 deg for 25 min - perfectly done. Also reduced cumin. Cheated on the sauce, and used jarred red peppers with chili sauce, garlic and olive oil., which was just fine. Will definitely be a repeat! Served with naan bread and a big green salad. p. 125 -Let me just say, we LOVED these. I thought they were outstanding. The wonderful roasted red pepper sauce was a perfect match for the sweet, tender meatballs. In the sauce I used one Thai bird chili vs mild, doubled the garlic and cider vinegar. Blended w Bamix (great!). Meatballs made as directed except doubled garlic, skipped cilantro, and reduced cumin to 1tsp.YO has you brown the meatballs on the stove then finish in the oven. I simply baked them in the oven @ 375 for 25 mins. As I mentioned we thought this dish was just wonderful. Honestly, it wouldn’t have mattered to us what was served alongside, these were the star of our show tonight! I’ll serve these again for dinner, as hors d’oeuvres or well, just any old time!! We could eat these here or there, we could eat these anywhere!! What more can I say?!! These are delicious little bites. I baked them at 400 for about 25-30 minutes, turning them half way through instead of pan frying and then baking. The roasted red pepper sauce was quick and tasty with lots (lots!) left over, which I'll probably use on some fish or potatoes. Fabulous recipe, we all loved this! I used ground chicken instead of turkey but other than that followed the recipe. I made 12 ping pong ball sized meatballs, and there was plenty of sauce (mainly cos the child turned her nose up at it). Served with the green beans in hazelnut oil from the same book. An overnight soak in a marinade resulted in juicy turkey predominantly flavoured with lemon and herbs. The first time I made this, I roasted as per the instructions (though my 850g piece took only 50 minutes). This time, I had a boneless, skinless breast (also 850g) and cooked it on the outdoor grill, which made it even more delicious. Leftovers made excellent sandwiches. Very nice dish. Cooking time for the duck was just a bit too long for my taste, but the flavors are delicious. The fennel rub and blood orange really show through, and the dried chilis give it a nice little kick. The flavor of the barbecue is really delicious. I didn't use quail- instead I subbed in the dark meat chicken (thigh) as suggested. This is absolutely delicious and quick. A really simple but delicious dish. The flavours of the salsa go so well with the salmon. Served it with lentils and a green salad. Had this with simply roasted kabocha squash and it was great. I really like the idea of the roasted red pepper standing in for the typical tomato in this dish. We cooked the salmon opposite from the instructions - cooked in the pan skin side down for a crispy skin. The salsa is one of the best I've ever had. This was pretty good - didn't knock my socks off. I'd add a few more hazelnuts if I made it again. This was a great variation on a salsa. It was sweet and tangy and cut the richness of the salmon. I would increase the hazelnuts next time. The recipe doesn't sound that exciting, but the results are fantastic... Great combination of flavours and textures. Serve with the fennel and pomegranate salad from the same book. Great fast recipe for a weeknight- I subbed Greek yogurt for the labneh and it was still amazing. Any firm white fish can be used (I used rockfish). Excellent starter/mid-sized dish. The labneh is really interesting and very easy to make - well worth the limited effort. Don't use too much dried chilli in the salsa as it can overpower the fish flavour. The pomegranate seeds are essential and really lift the falvour and appearance of this dish. If using shop bought preserved lemons a single fruit would do for probably up to 6 people. Made this for a weeknight dinner for two. My fishmonger didn't have sea bass so I subbed halibut since it was in season. It's not pomegranate season so I couldn't find any in the stores and had to skip that. Even with the substitution/deletion it was fantastic! I think the labneh and the preserved lemon really made it. I am looking forward to making it again for a dinner party. As a main, I will serve the pita on the side. Delicious and so simple. I have this book for years and I don't know why I haven't made this before! I served it with roast potatoes and a simple tomato, cucumber and carrot salad. Made with ouzo, which is what I had on hand. This is a new once-every-two-months dish. What can I say? Insanely delicious, preposterously easy. Fabulous and quick. Even my 4 year old grandson asks for more. Feta, chard, sunchokes, and cream make a good combination for a rich, yet healthful tart filling. The total baking time is quite long, however; I ended up baking the shell and the filled tart at 400F to finish the process in about an hour total, and that worked surprisingly well. For the last several minutes, I took off the foil and turned on the broiler to be sure it was completely cooked. The sunchokes were a little on the crunchy side - my fault, as I hadn't boiled them for the full 15 minutes. I left out the rosemary as I didn't have any, and just additional extra cream since I had no creme fraiche. I used a pyrex pie plate, and the only issue was that there was too much filling to fit in the dish. This would work well as a brunch dish or as part of a buffet. I broiled the tart for a few minutes at the end to get the topping to brown. The dominant flavours are actually feta and chard - not jerusalem artichoke. But delicious. This is one of the most delicious pies I have made. I used some good quality pork sausages and organic beef mince. I will definitely make this again. Delicious! I just used a regular pie dish but the filling all made it in. Took more like 30-40 minutes for the eggs to set. I strongly suspect that the oven temps given in the US copy were not adjusted for conventional ovens. Nothing cooked in the time allotted. Recommend adding 25 F to the temperatures provided in the book. This was my first attempt at making brioche, and while the end result was good (I used it for the tomato, olive, & feta "pizzas" that follow the brioche recipe in the book), I had some difficulty with the dough. Mainly, it makes a very small amount, and my mixer does not handle small batches very well. I had to scrape down the bowl many, many times to get the butter to incorporate. The dough was also incredibly sticky, but I figured that was perhaps in my favor - I was able to liberally flour the surface when rolling it out without worrying that it would be too much. Since it makes only a small batch, I think next time I will double the recipe to see if this makes the mixing easier. I made this a second time, doubling the recipe, which did make it much easier to whip into shape with the dough hook. It still took time, however - probably around half an hour of high speed mixing. The dough never fully pulled away from the sides of the bowl, but I was afraid adding too much additional flour would toughen it. Thankfully, the loaf I baked with half the dough turned out light and tender, although it took half an our to brown properly in my oven, not the mere 15 minutes the recipe suggests. Briny olives, caramelized onions, and brightly acidic tomatoes are an interesting and appealing contrast with tender, buttery brioche dough. I think these would make an elegant appetizer or savory brunch item, but we made a light meal out of them by pairing them with a hearty white bean salad. The topping combination is good, but brioche dough is more work than regular pizza dough (not to mention a lot richer), so these aren't likely to replace pizza in my meal planning. Still, I could definitely see putting in the effort for a special occasion . Apparently I couldn't resist this topping combination, because I made them again for dinner. To make it easier for a weeknight, I found the it was OK to leave the dough out in a covered bowl during the day, then roll it out and top it without giving it another chance to rise. Mine were rather large, so needed almost a half hour in the oven at 325F. Maybe baking at 350F would speed up the cooking a little without being too hot. I didn't bother rolling my puff pastry thinner but otherwise followed the recipe as written. Relatively simple work for the amazing results that I got. I would probably cut the puff pastry into bite-sized squares if I were to serve it at a party. Prepared this dish using commercial puff pastry (which I rolled out to be thinner, as suggested in the recipe). The combination of sour cream, sweet potato, and goat cheese was wonderful! I didn't have the hot pepper, and in place I sprinkled some chili powder on the sweet potatoes. They were not at all spicy, though, and I think next time I would either use more chili powder or something stronger. I also didn't trust my pumpkin seeds (which are now chicken food), and so substituted pine nuts. The final step is brushing on oil that has sat with crushed garlic and contains parsley. For me, this was somewhat difficult - the parsley is difficult to distribute. Next time I would prepare the garlic oil, brush that on the pastries, and then sprinkle on the parsley. Definitely an impressive appetizer for new year's eve, and enjoyed by all. Oh my! This was gorgeous, I made it for a picnic and everyone loved it. Definitely a repeat recipe here. I baked & sliced the sweet potatoes the day before to save time and it was perfect. These are so nice, they don't last very long! The cake was lovely but not a raging success. Reading through the previous note maybe I overcooked it to as it was a little dry. I didn't have time to make the icing so mixed some maple syrup through cream freshe which gave it the needed moisture. We liked this but didn't love it. It seemed rather dry, despite all the olive oil, but I may have overcooked it a bit, though I took it out the oven a couple of minutes early. If I make it again I think I'd start checking after 70 minutes as a cake baking for 90 minutes presumably has quite a bit of variation for different ovens. The maple icing was delicious though I wasn't at home so didn't have my stand mixer so had to mix it by hand, which meant it wasn't as smooth as I think it would have been with the paddle attachment. I made this with 2x20cm sandwich tins instead of a 20cm cake tin. The cakes were done after 25min in the oven. Thanks to the comments on the timing otherwise I would have an overdone dry cake. As it is after 25min, the cakes were very moist. I also made only 2/3 of the icing and that's just enough. I am making this again next weekend! My cake was done after 45 minutes instead of 1 1/2 hours. The unbaked batter had a very strong olive oil taste, but the finished cake was absolutely delicious! This is definitely going into my Favorites - everything I love about a cake. The almonds and polenta give it a wonderful texture and the orange flavor is intense but not too much. I was worried about over cooking it, as I'd read a review saying it was quite dry so took it out at 40mins. Though that person could have been following the recipe in Gourmet (which the online link goes to) as it says 60-75mins . That would be far too long - if you want it moist do closer to 45 min. Most of it got eaten by the book group ladies but some left, and just as good the next day. I've made this a handful of times, with variations (different polenta grinds, different citrus, etc. ), but it's been incredibly moist and flavorful each time. I think (in our oven), we cook it closer to 50-55 minutes, so definitely make sure to check... it sounds like there's a range out there. What a fabulous cake, loved the texture and the flavor. Adding the second layer of cake to cook for less time makes it special. I made this cake for Father's Day to accommodate my sister-in-law who is gluten sensitive. It is one of the best things I've ever baked- so rich it was almost like a candy bar. I served it with raspberries to cut some of the richness. I liked the technique of adding half the batter after the first half had already baked for a while to get two textures, but honestly, you could also just throw it all in at the same time and it would still be great! Brilliant. Used brown sugar instead of muscavado. Better after a day. Delightful. A surprisingly tasty, moist, long-keeping cake (well it's been out on the counter for a week). I thought it was going to be dry as it seemed so crunchy and ugly but inside it is moist and yummy with the cream cheese icing on top - though i thought some orange zest would be a nice addition to the cream cheese. I found this to be extremely sweet. Too sweet for me, my guests and my family. I should have realised when I saw the recipe called for 270g sugar and only 160g flour. However, the cream cheese icing is lovely. A lighter style of carrot cake, which we enjoyed quite a bit. Not like the typically dense American version (although we love that one too). These were just perfect! I had plums that were not ripening anytime soon so I cooked them for a little longer than stated for the compote, and could have easily added more than the 80g stated to the batter to make them a little more fruity. The texture and flavour were excellent and the family gave them 5 stars. I'm looking forward to having these as a snack during the week and spooning the compote over yoghurt in the mornings. Very good - but use VERY ripe plums. I put the compote in but not on. We loved these muffins. I made them as mini muffins - baking time was approx 25 mins. I was also short on fresh blueberries so I supplemented with some rehydrated dried blueberries. You probably only need a 1/4 recipe of the toping (not 1/2). A fun-looking muffin that packs a yummy punch. I reduced the sugar to 160g; next time would do 190g. I don't see this on any other comment, but this made 16 muffins with tins full to the brim? Are UK muffin pans bigger?? Not complaining, not sad to have a few extra of these around. I also used almost half whole wheat pastry flour, cut oil to 1/3 cup, and added 1/3 cup applesauce. I think I did bake them around 25-27 minutes. Okay... Maybe there's something wrong with my sugarometer, but I didn't think these were too sweet! I thought they were great. Dense with fruit (and vegetable I suppose) and coconut. But the real winner for me was the streusel topping - I'm going to have a go adapting the ingredients into a granola. I thought the black sesame seeds would be a bit much, but I think they add a really interesting, almost savoury, note. Also - a minor point - but I thought these were better slightly warm than completely cold. Excellent, I don't think I have ever made muffins that tasted this good! I reduced the amount of sugar by 30g and next time I'll try using even less, because as others have said before they were quite sweet. Also, after 25 minutes the muffins were not ready, they needed at least 10 more minutes in the oven. These muffins are very moist and flavor packed; the crumb topping is especially delicious and just a little unexpected, what with the addition of a variety of seeds. I used the full amount of sugar, but agree that they probably didn't need that much. I also used raw hazelnuts in place of pecans. In my muffin tins, this recipe made 19 relatively small muffins (a nice size if you just was a little snack). But delicious as they are, I probably won't make them too often, as they are more labor intensive than most. I have made these five times, never disappointed. I add things like orange zest, or goji berries or currants instead of the sultanas, so they are slightly different each time. Tasty but very, very, sweet. I would definitely reduce the amount of sugar the next time I make these. Reduced the sugar by one quarter, still excellent. Great crunch from the seed topping! I made these with half whole wheat flour and half the amount of sugar (they were plenty sweet). In my standard (I thought) muffin pan, filled about even with the edge, I came out with 19 muffins, which used all the topping, piled on generously. Tasty, nice textures. I brought these to a class today and they were well received by all. A great variation of the morning glory muffin, which is my favourite! As others have commented, the muffins were a bit sweet for our tastes, and so I would reduce the sugar next time (maybe by a quarter of a cup). Because I have a mound of zucchini from my garden, I replaced the carrots with zucchini. I also added dried cherries instead of raisins. We loved the "bird seed" honey-scented crumble, which enhanced the various tastes of the muffins and added another dimension of crunchiness. This made 12 muffins, in a standard American pan. I did 1/2 the sugar, as I do not have a sweet tooth, and should have reduced the sugar more. They are pretty labor intensive, but overall came out great. I think I will make them again only if we have friends in town. I like this recipe a lot, but must admit that I tweak it a bit to increase the hazelnut flavor. I make them with 4 T hazelnut oil and 115 g butter, use USDA large eggs instead of small, and increase the ground hazelnuts to 65 g. I also add some vanilla. This makes for deliciously nutty cakes. I have not made the accompanying cream cheese icing, but instead use a chocolate ganache spiked with Frangelico. I made these several years ago, and found them to be moist and intensely chocolaty, thanks to the large quantity of chopped chocolate that mostly melts into the batter as it bakes. The almond flour does not register, flavor-wise but probably contributes moisture. Very easy to mix up by hand, as the recipe does not require a mixer. I did not use the ganache icing, and the cupcakes are so chocolaty it might be overkill vs. another flavor. This is a lovely cake. I suspect I will make it again. used 150g apple and 100g dried pear and added some ground almonds to the crumble. Like jifar, I added ground almonds to the crumble. The crumble recipe is for a large amount, for this recipe I prepared 10%, and it was the perfect amount. I used only 75g of apple and 200g pear. I was afraid the cinnamon and cloves would dominate, but no fear - it was a perfect complement. A light and delicately flavored cake. The ONLY negative is that I dirtied up 7 bowls! I liked a lot, but not everyone did. Should be called Cardamom Shortbreads w/Pistachios. Very nice flavor and texture, but nobody loved. Deliciously heavy on the cardamom. These do not look like the picture. I even got a ruler out to measure these things as I was cutting them, but after 35 minutes in the oven (recipe calls for 20) they still were not the least bit brown on top. I liked these - agree with laurenlangston that they need to be baked a lot longer than Ottolenghi states. Depends on your oven I guess, but mine took about 30 minutes to cook. Entering them for the Muswell Hill and District Horticultural Society Spring Show cookery class for shortbread - wish me luck! Wasn't sure whether oven temp was for fan forced, so lowered it. Wrong. Loaf was mushy in middle. Back into oven. Did spread a lot. Followed oven temp for 2nd baking. Biscotti disappeared off plate very quickly! Might add a little more ground Ginger next time, but that's just me. Really enjoyed them. I was afraid this will be very sweet with the white chocolate and dried cranberries. But it is just the right about of sweetness, and a very nice texture with the oats and dried cranberries. Ottolenghi asked you to form the dough into balls the size between an olive and a walnut. I made it slightly bigger than a kalamata olives and the resulting cookie is very small. Maybe Ottolenghi uses much larger olives than I do? If you are making tiny cookies the size of olives, you don't need to put them 6-7cm apart as instructed. I used 4-5cm and it's fine. Very good. Sweet but not overly so. These were really simple to make and a huge hit. It was easy to spread these out with fingers (much easier than using a fork). I drizzled dark chocolate over the top as it seemed too fiddly to coat the base. Simple and tasty however i cooked them longer than requested until satisfyingly golden all over. They would be even better with some glace cherries or dried cranberries or similar added as the almonds are a bit dull on their own. I don't know why -- perhaps I didn't convert the oven temperature properly since I have the English version which calls for Mark 1 oven -- but these did NOT cook in 12 minutes. I cooked them at 300 degrees F and at the 20 minute mark they were still not done, so I upped the temperature a bit and gave them 5 more minutes. They are still soft at this point but the almonds nicely lightly colored and they crisp as they cool. They were fabulous and a big Seder hit. HOWEVER, next time I would make them much smaller than the 8 cm called for because at a Seder people are eating small portions of about 5 or 6 desserts. Paired with Mom's oranges in light syrup they are sensational. Passover friendly! If grinding own icing sugar. Simple cookie. Good, but a little too sweet for my taste. Tasted better the day after baking. These were pretty good, but I think mine were underbaked, as seems to almost always be the case when I make bars. They looked done, and they certainly weren't raw, but in future I would probably bake both the crust and the topping ten minutes longer than called for, and I might increase my oven temperature to 350 F. They were a little too crumby, and I'd also like the nut topping to be better caramelized. These granola bars are good, but quite sweet. I varied the ingredients based on what I had at home - dried blueberries instead of apricots and cherries, cashews in addition to pecans, no sesame seeds, and not quite the full amount of oats. It all worked out, but I had to bake them for almost twice as long in my Pyrex dish for them to set properly. Delicious and marshmallowy on the inside. Needed 10 egg whites. Made a little smaller and reduced cooking time. Cinnamon and hazelnut meringues. Very good - loved the texture and taste of these. I have never used this technique to make meringues before. Heating the egg whites and the combined sugars over a pan of simmering water in a heatproof bowl and leaving for 8 minutes for the sugars to dissolve stirring occasionally had me a little worried as I thought the egg whites would start to cook and I would end up with something that would be fit for the bin. However I trusted the process and was rewarded with great meringues! Very very good. I also just made a rough pastry by pushing it into the springform pan after rolling out just a little. Also omitted apricot jam. Still a winner. This is one of the most delicious tarts I have made in a very long time. Despite my issues with rolling out the pastry, the baked crust had just enough crunch and cutting through with a fork works really well as compared to some other sweet shortcrust pastries I made in the past. The semolina custard is the best part of the tart and reminded me a lot of my childhood when my mum made something similar yet less rich without cream and egg when I was sick. The custard is then topped with fresh raspberries before it goes into the oven, the tartness of which complement the sweetness of the custard perfectly. Yum! I often make clafoutis during the summer months with whatever fruit I have on hand. I used nectarines for this recipe, and it did not disappoint. The creamy vanilla speckled (I used paste not a bean) warm custard is hiding another layer of nectarine underneath. Excellent show-off dessert for the holidays. Prepared the dough, the mascarpone cream and the crumble one day ahead as recommended and the final galette came together very quickly. This is a really fresh tasting tahini sauce, and very versatile. 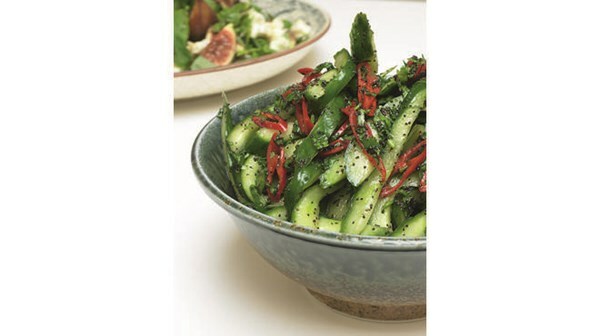 We used it with the broad bean and radish salad from Ottolenghi: The Cookbook, but it would work well with grilled meat, as a sandwich spread, with crudités, or as an all-purpose salad dressing. Made this without the parsley for the marinated eggplant recipe in this same book. Very good. Make sure to use a lot less sugar if using for the savoury fennel gratin dish in this book. It is a bit more sweet than I usually like. I did find the recipe gave me a bit too much liquid, so I don't think the 3tbsp water was really necessary. I was pleased with the way this "rough" puff pastry turned out; the flakiness and texture was comparable to store bought pastry, but the flavor of an all-butter pastry like this one is definitely superior. I used it to make pasties. This method is a little more involved than the one from Chocolate & Zucchini, but yielded better results for me. It's not very time consuming to make, either; you just have to remember to start it a day or so in advance of when you want to use it. ...I suspect I've discovered what will become my favorite cookbook of the year...This is my kind of food - abundant family-style platters, big color, bold flavors, and generous use of whole grains. I keep making their French bean salad with hazelnut & orange and the twice-baked flourless chocolate fudge cake – just to name a couple. Because of the tang of the sour cream, bright bite of the gremolata topping, and saltiness of the cheese, these galettes tasted surprisingly light. Everything about this easy entrée worked great. The final dish looked quite beautiful—perfect for a dinner party or holiday entertaining. No problems here. The feta and preserved lemon were a particularly smart inclusion here, as their sharp saltiness tempered the deep, earthy notes of the braised mushrooms. It is hard to describe. It is like a cross between a cake and a baked chocolate mousse or soufflé...It packs a lot of dark chocolate and is probably best reserved for the most of ardent chocoholics. The focaccia takes its time but sometimes the good things in life can't be rushed. Thankfully, you can eat both healthy and delicious food. Simultaneously. This dish being the prime example. The sweet potatoes, which are simmered in a mix of honey and water are addictive. What a delightful combination...I did find the dish a tad too oily for my liking (and I did not even use the full amount of olive oil stated in the recipe). Would recommend that less oil be used. ...a substantial, color-flecked platter showcasing citrus-dressed grains punctuated by pistachios, dried apricots, and arugula. These crispy Florentines are super-simple to make, requiring just a few ingredients mixed together and baked. Who doesn’t love that? This produces a voluptuous cake that is moist-crumbed and deeply aromatic (but not at all boozy), and one I plan to make again soon, possibly in cupcake form. 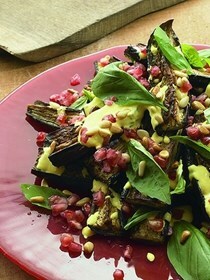 Available for the first time in an American edition, this debut cookbook, from bestselling authors Yotam Ottoloenghi and Sami Tamimi of Plenty and Jerusalem, features 140 recipes culled from the popular Ottolenghi restaurants and inspired by the diverse culinary traditions of the Mediterranean. Yotam Ottolenghi's four restaurants–each a patisserie, deli, restaurant, and bakery rolled into one– are among London's most popular culinary destinations. Now readers who can't travel to one of the pristine food shops can re-create its famous dishes at home with recipes like Harissa-Marinated Chicken with Red Grapefruit Salad, and Cauliflower and Cumin Fritters with Lime Yogurt. The recipes reflect the authors' upbringings in Jerusalem yet also incorporate culinary traditions from California, Italy, and North Africa, among others. 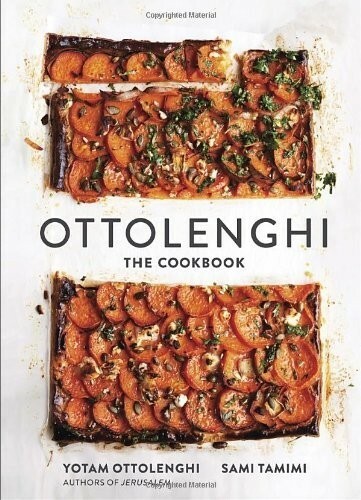 Featuring abundant produce, a full chapter devoted to the "mighty eggplant," and numerous fish and meat dishes, as well as Ottolenghi's famed cakes and breads, Ottolenghi invites readers into a world of inventive flavors and fresh, vibrant cooking.